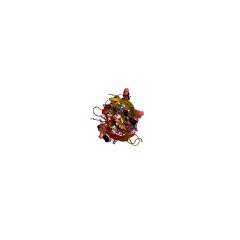 The domain within your query sequence starts at position 1076 and ends at position 1210; the E-value for the C1Q domain shown below is 6.74e-49. 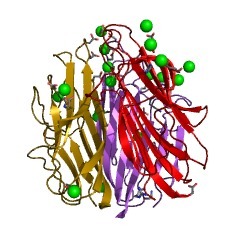 Globular domain found in many collagens and eponymously in complement C1q. 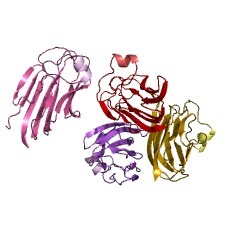 When part of full length proteins these domains form a 'bouquet' due to the multimerization of heterotrimers. The C1q fold is similar to that of tumour necrosis factor. 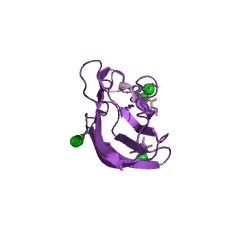 This entry represents the C-terminal domain of C1q. 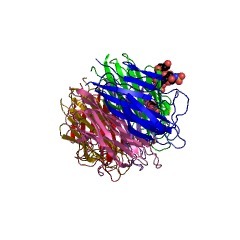 C1q is a subunit of the C1 enzyme complex that activates the serum complement system. C1q comprises 6 A, 6 B and 6 C chains. 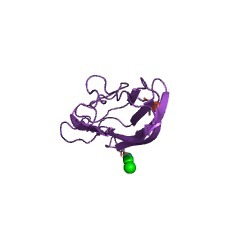 These share the same topology, each possessing a small, globular N-terminal domain, a collagen-like Gly/Pro-rich central region, and a conserved C-terminal region, the C1q domain [(PUBMED:1706597)]. 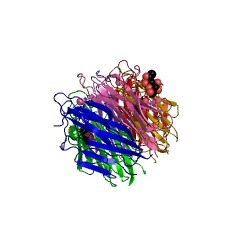 The C1q protein is produced in collagen-producing cells and shows sequence and structural similarity to collagens VIII and X [(PUBMED:2591537), (PUBMED:2019595)]. 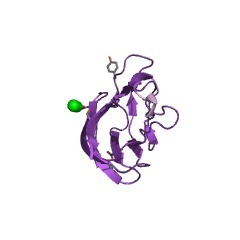 This domain is also found in multimerin and EMILIN proteins. The C-terminal globular domain of the C1q subcomponents and collagen types VIII and X is important both for the correct folding and alignment of the triple helix and for protein-protein recognition events [(PUBMED:1867713)]. 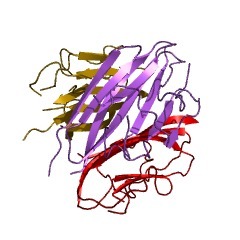 For collagen type X it has been suggested that the domain is important for initiation and maintenance of the correct assembly of the protein [(PUBMED:1860888)]. 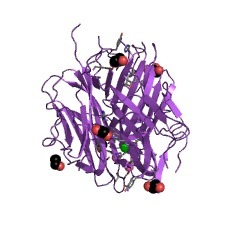 The globular head is a trimer of C1q domains. Each individual C1q adopts a 10-strand Jelly-roll fold arranged in two antiparallel 5-stranded beta-sheets [(PUBMED:22892318)]. 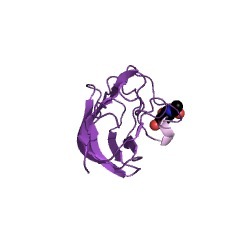 There are two well conserved regions within the C1q domain: an aromatic motif is located within the first half of the domain, the other conserved region is located near the C-terminal extremity. 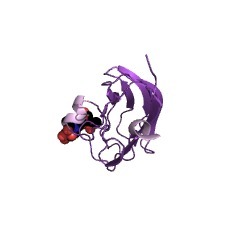 There are 9593 C1Q domains in 9170 proteins in SMART's nrdb database. Taxonomic distribution of proteins containing C1Q domain. This tree includes only several representative species. 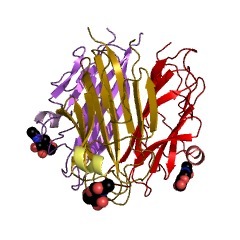 The complete taxonomic breakdown of all proteins with C1Q domain is also avaliable. 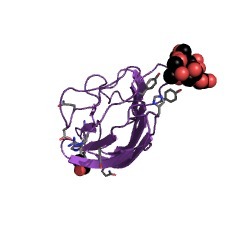 Click on the protein counts, or double click on taxonomic names to display all proteins containing C1Q domain in the selected taxonomic class. 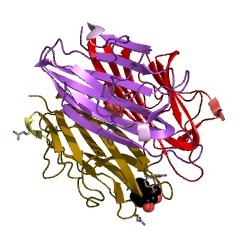 The crystal structure of a complement-1q family protein suggests an evolutionary link to tumor necrosis factor. 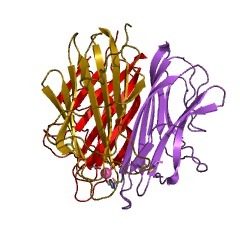 ACRP30--adipocyte complement-related protein of 30 kDa or AdipoQ--is an abundant serum protein, secreted exclusively from fat cells, which is implicated in energy homeostasis and obesity [1,2]. 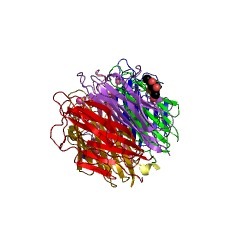 ACRP30 is a close homologue of the complement protein C1q, which is involved in the recognition of microbial surfaces [3-5] and antibody-antigen complexes [6,7] in the classical pathway of complement. 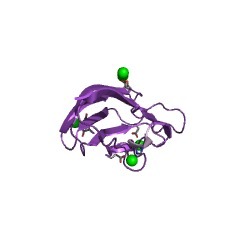 We have determined the crystal structure of a homotrimeric fragment from ACRP30 at 2.1 A resolution. 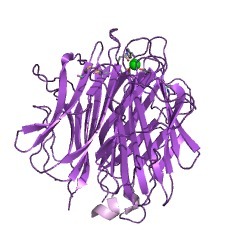 The structure reveals an unexpected homology to the tumor necrosis factor (TNF) family. Identical folding topologies, key residue conservations, and similarity of trimer interfaces and intron positions firmly establish an evolutionary link between the TNF and C1q families. We suggest that TNFs--which control many aspects of inflammation, adaptive immunity, apoptosis and energy homeostasis--arose by divergence from a primordial recognition molecule of the innate immune system. 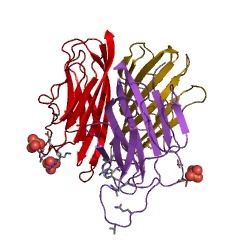 The evolutionary connection between C1q-like proteins and TNFs illuminates the shared functions of these two important groups of proteins. 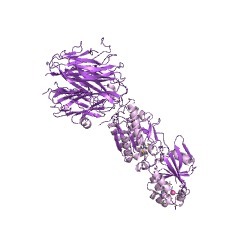 The fibrillar collagens, collagen VIII, collagen X and the C1q complement proteins share a similar domain in their C-terminal non-collagenous regions. 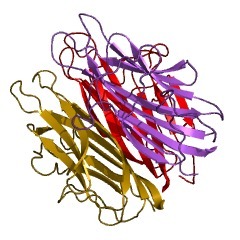 A sequence comparison of the C-termini of collagens X, VIII, the collagen-like complement factor C1q, and the fibrillar collagens showed a conserved cluster of aromatic residues. This conserved cluster was in a domain of approximately 130 amino acids that exhibited marked similarities in hydrophilicity profiles between the different collagens, despite a low level of sequence similarity. 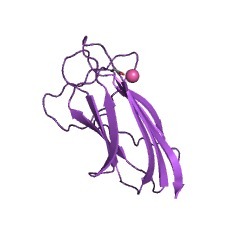 These data suggest that the 'collagen X-like family' and the fibrillar collagens contain a domain within their C-termini that adopts a common tertiary structure, and that a conserved cluster of aromatic residues in this domain may be involved in C-terminal trimerization. Isolation, sequence analysis and characterization of cDNA clones coding for the C chain of mouse C1q. Sequence similarity of complement subcomponent C1q, collagen type VIII and type X and precerebellin. 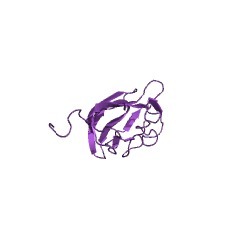 A mouse macrophage lambda gt11 cDNA library was screened using a genomic DNA clone coding for the C-chain gene of human C1q. 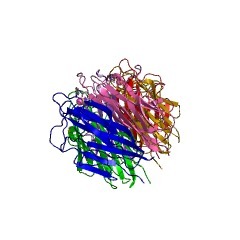 Approximately 600,000 recombinant phage plaques were hybridized with peroxidase-labeled human C-chain probe and detected by enhanced chemiluminescence. Five positive clones were obtained. The size of the full-length cDNA is 1019 bp. The sequence identity of the nucleotide sequence with human C1q C chain is 79%, the identity of the deduced amino acid sequences is 73%. 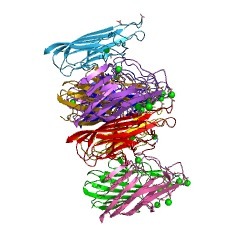 The mouse C1q C chain exhibits the same structural features as the human C chain, e.g. conservation of the cysteine residues. 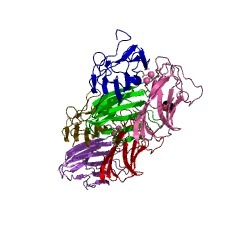 Like the mouse A chain, the mouse C chain has an RGD sequence that may be recognized by receptors of the integrin family. 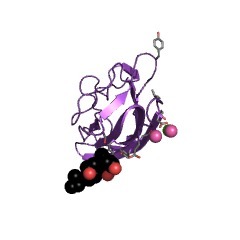 No RGD sequences have been found in any of the human C1q chains. The size of the C-chain mRNA (1.2 kb) and its tissue distribution (macrophages being the cell type with the highest mRNA concentration) are identical to the mRNA of the mouse A and B chains. 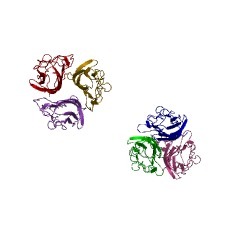 Alignment of human and mouse C1q A, B and C chains exhibits two blocks of highly conserved residues within the C-terminal globular regions. 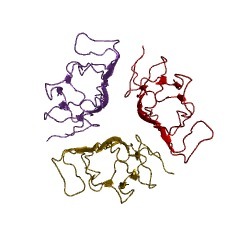 Three other proteins, collagen type VIII and type X and precerebellin share this similarity with C1q, indicating the structural and probably functional importance of these regions within the non-collagenous domains of the molecules. 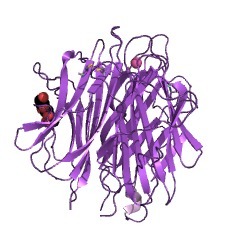 SwissProt sequences and OMIM curated human diseases associated with missense mutations within the C1Q domain. This information is based on mapping of SMART genomic protein database to KEGG orthologous groups. 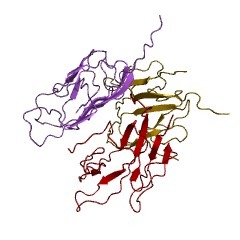 Percentage points are related to the number of proteins with C1Q domain which could be assigned to a KEGG orthologous group, and not all proteins containing C1Q domain. Please note that proteins can be included in multiple pathways, ie. the numbers above will not always add up to 100%.